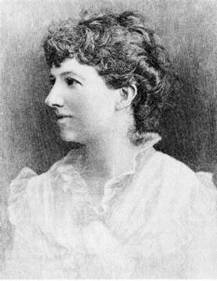 Grace Elizabeth King (1852-1932) is perhaps best known today for her frequently anthologized story entitled “The Little Convent Girl,” first published in 1893; but she was actually a prolific writer who was highly regarded as a woman of letters during her lifetime. Her work covers a great variety of genres, from fiction (3 novels, 2 novellas, 3 collections of stories and 14 uncollected stories, a play) to history and biography (especially the colonial history of Louisiana, her native state, and the lives of several Louisianans); she is also the author of an autobiography and of numerous magazine articles and sketches. Interest in King’s work waned during the last years of her life, mostly because she was still writing about the past instead of contemporary events, but also because she was recognized as a member of the Local Color school – already considered a minor genre by the turn into the 20th century. In other words, she encountered the same fate as another female writer who used New Orleans and Louisiana as a backdrop for her stories and was also labelled a local colorist, the now celebrated Kate Chopin. Interest in Grace King was revived in the 1970’s and 1980’s. Instrumental in this respect were Robert Bush’s anthology (Grace King of New Orleans: A Selection of her Writings, 1973) and, a decade later, biography of King (Grace King: A Southern Destiny, 1983), as well as Anne Goodwyn Jones’s chapter in her 1981 study of seven women writers from the South (Tomorrow is Another Day). Feminist critics also became interested in her when they realized that her fiction was centered on the ways in which women’s lives (both black and white) were affected by the socio-historical context of the Civil War and Reconstruction in New Orleans. King may be a local colorist in many regards, but the themes that recur in her fiction, her treatment of them, her use of irony, her handling of language (in particular dialect) and of structure, as well as her style, enable her to escape the sentimentality and nostalgia associated with the Local Color school and therefore to transcend the limits of the genre. This conference will be the eighth meeting of the European Study Group of Nineteenth Century American Literature, a group that was established during the biennial EAAS (European Association for American Studies) conference in Cyprus and has met annually since its creation. The group’s meetings have been hosted by different universities in countries as varied as Poland, Turkey, France, Italy, Spain and Romania. This year’s conference is organized by the research center I.D.E.A. (Interdisciplinarité dans le monde Anglophone) and sponsored by Université de Lorraine and Nanterre-based research group FAAAM (Femmes Auteurs Anglo-Américaines). It aims at exploring various aspects of Grace King’s fictional works in order to show that her portrait of New Orleans society and her depiction of women’s predicament were not only insightful but actually quite subversive; it also aims at fostering renewed scholarly interest in her. a keynote address delivered by Melissa Walker Heidari, Associate Professor at Columbia College, South Carolina, who published “To Find My Own Peace”: Grace King in Her Journals, 1886-1910, in 2004 with the University of Georgia Press. Her contribution will enable us to grasp Grace King’s personality and life experiences more fully before we turn to a study of her texts. It will no doubt provide us with a keener perspective on King’s writing processes, her view of herself as a writer in relation to other writers, and thus her own self-awareness of being a woman writer. We welcome contributions touching upon various areas, either on “The Little Convent Girl” or on King’s other works of fiction. Topics that can be addressed include (but are not limited to) gender, genre, race (and possibly how those three interact), sexuality, the color-line, myth, history, region, cultural milieus/cultural landscape of New Orleans, southernness, language (in particular King’s use of the vernacular and of French), intertextual connections (for ex. with George Washington Cable or Kate Chopin), modernity/modernism, southern gothic.